(Newser) – Paper, plastic, or diaper bag? 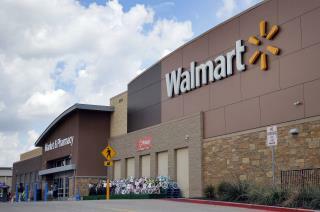 A woman shopping Sunday morning at a Walmart in Payson, Utah, surprised workers and customers when she approached Register 11, dropped to her knees, clutched her stomach, and … pulled out her wallet. She was in labor, ABC News reports, but she insisted on paying for her items first before she took care of her next transaction: having the baby right there in the store. "We weren't really interested in taking her money at [that] point, but she insisted," says Walmart manager Dustin Haight, who KSTU notes called 911 and implored her not to worry about the tab. "It wasn't like she was like, 'OK, let's get this baby out and [then] I'll pay.' She paid and then had the baby." Anchor Baby cleanup on isle 7. That boy should at least receive a symbolic walmart citizenship.